Think Panda Eyes? What springs to mind? Cuddly panda faces with those gorgeous black splodges, or a faceful of smudged makeup the morning after the night before? Well, now, as our editor has been finding out, there’s a third option – super smart Panda Optics. Snow, snow, snow and yet more snow! We’ve all seen the recent forecasts in the Alps where numerous resorts have had more snow than they could handle. I was lucky enough to be in St Anton at the start of this bout of heavy snowfall. I say lucky, but actually… between you and me… I fear in recent years I’ve been turning into a fair weather skier. 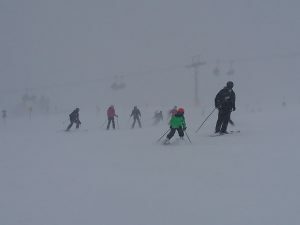 Let’s just say, when the visibility’s poor, not only do I start skiing like a beginner but also you’ll usually find me skiing anxiously to the nearest hot-chocolate stop rather than carving confident fresh turns in off-piste powder – yes even in St Anton! But, for once, in fact for the first time, the foggy pistes weren’t stopping me from skiing. 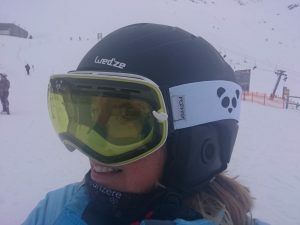 That’s because I’d been sent some Panda Optic goggles to test and boy, oh boy, I have to say it’s completely revolutionized my poor-vis skiing. Now I’m on the piste all day and, what’s more, it’s reduced my anxiety considerably. Oh, and did I say that whiteouts make me want to vomit? Well, not anymore – thanks to Panda Optics. 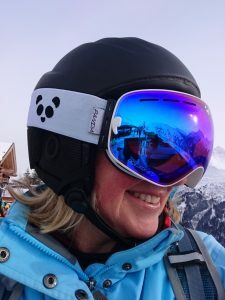 These magic goggles… they were Panda Optics’ Diabolo White – a semi-frameless pair with a quick lens changing system and a smart detachable strap featuring the company ‘panda’ logo and a bunch of bamboo – quirky, yes; stylish, yes; coveted by my teenage boys, yes. I really felt the part… “Devilish” even in my “Diablos”! Each day you can choose which lens and strap combinations you wear. The Diabolo comes in a smart black and white panda box and micro-fibre bag (great for safe transportation/storage), together with two lenses – a polarised mirrored Glacier Blue chrome lens (with UV400 protection and anti-glare properties) and a Maize Yellow low-light HD lens. Needless to say, with so much snow, I used the yellow lens for most of the week. It seriously revolutionised my whiteout skiing. The Maize Yellow lens offered more piste definition and greater contrast of snow/sky than I’d ever experienced before. 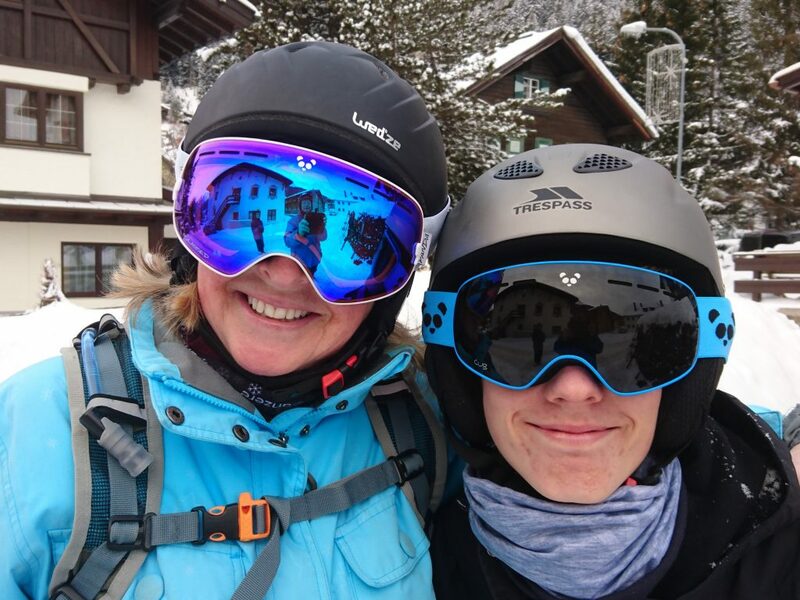 The rimless design of the goggles and their Quick Change Lens System also means you can change the lens swiftly and simply – just a quick twist of a couple of tiny side-clips and you can pop one lens out and press the other one in. Panda Optics claim it’s one of the fastest/easiest lens changes available” and I can well believe it: I even managed to change them over on a chairlift without too much ado. Both lenses are integrated with Guma® technology to absorb and distribute any fog, while lens vents also help to ventilate the goggles. Importantly, the goggle frames are made of TPU, a light-weight, stress-resistant material which is flexible and withstands environmental extremes but is also offers protection against high-velocity and high-mass impact. The white ‘Diablo’ goggles also come in black or green and cost £89. They come with a lifetime warranty and a 20-day return policy. For more details and to buy yourself a pair, go to the Panda Optics’ website by clicking HERE. But don’t stop there. Panda Optics do really cool kids’ goggles too. You’ll find our review for their Panda “Cubs” goggles HERE.